When the weather cools down, there’s nothing I love more than stew. Okay, maybe I love pumpkin more, but I digress. 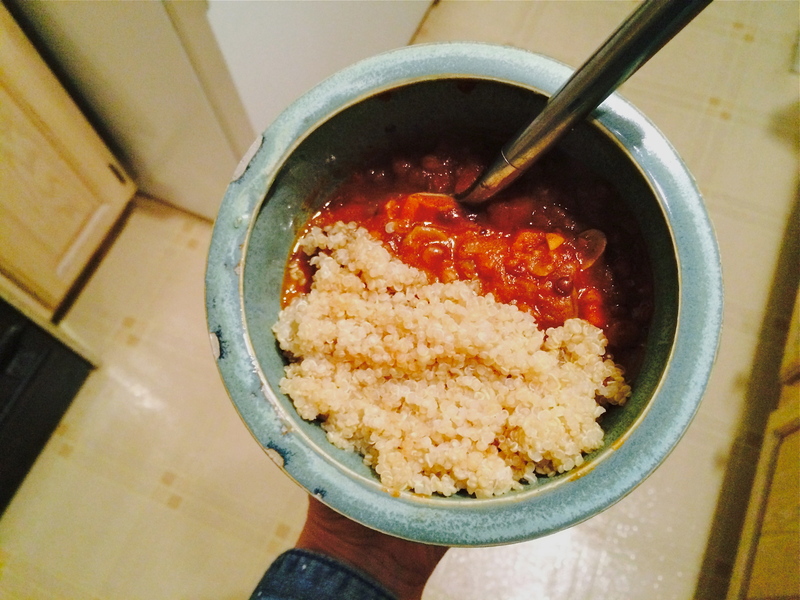 Not only is stew fool-proof, but it allows for creativity. Have carrots? Peppers? Onions? Eggplant? Great! Now throw in some meat and seasoning and you’re good. You can change up the protein or vegetables or spices and create a completely new and delicious stew. The true beauty of stew, though, is the leftovers! Make a big batch and freeze the leftovers in individual containers for a quick meal when you get home late from work or just don’t feel like cooking. Share your tips and tricks for making one – or more freezer meals. It’s the end of the gardening season for some of us; let’s store away that produce in heat-and-eat-from-the-freezer-meals. Show how convenient healthy freezer breakfast, lunches or dinners can be! My freezer meal is the aforementioned stew, but with a spiced Moroccan twist. The key ingredient here is grass-fed beef, which provides a rich, slightly gamey taste that I absolutely adore. Look for 100% grass-fed beef because it, along with all 100% grass-fed meats, contains conjugated linoleic acid (CLA), which is the plant form of omega-3 fatty acids. In other words, grass-fed meat has a healthier fat source, not to mention it means the animal had a happier, freer life. Top this stew with a little quinoa or some sauteed potatoes and you’ve got a hearty, filling meal. Make a big batch of the quinoa/potatoes and you’ve got another side ready to go for later eating. Heat coconut oil in a large pot. Add onions and saute for 2-3 minutes, then add beef. Saute beef for 5 minutes, making sure to sear all sides of the beef cubes. Add remaining ingredients, and bring to a boil, then simmer for 25-30 minutes, or until carrots and eggplant are tender. For more amazing freezer meals, check out the link below! One of the best parts of summer is the amazing produce that’s available in Chicago — especially fresh-from-the-garden tomatoes (or fresh-from-the-CSA in my case). 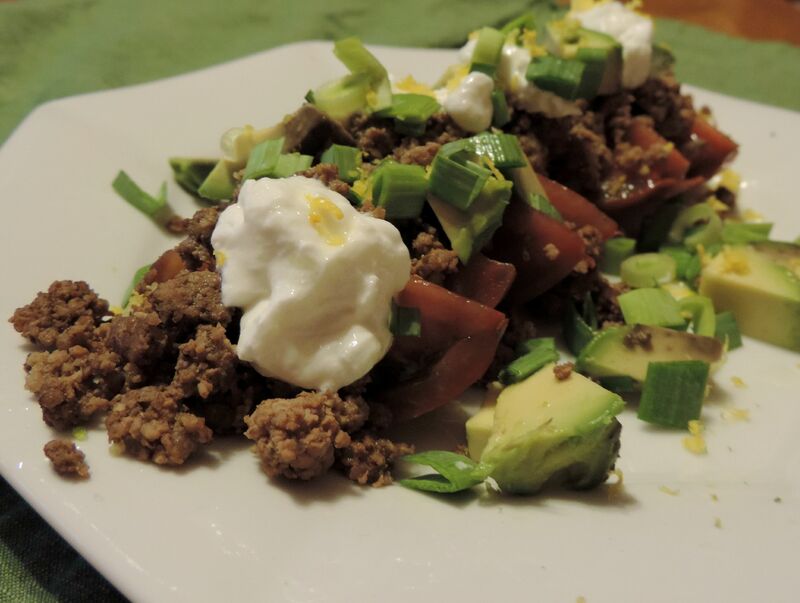 Top those tomatoes with deliciousness in the form of taco-seasoned lean ground beef (plus some other goodies), and you’ve got a light summer meal. By posting this recipe I am entering a recipe contest sponsored by The Beef Checkoff and am eligible to win prizes associated with the contest. I was not compensated for my time. Now, I am not a chicken breast all day, every day kind of girl. I love beef, whether it’s a perfectly-grilled steak, juicy burger, tacos, meatballs or meatloaf, beef frequents my table. Beyond the delicious flavor of beef, it’s got loads of nutrition. First off, let’s talk protein. A 3-ounce serving of lean beef provides 25 grams of protein and 10 essential nutrients. Emerging research indicates that evenly distributing daily protein intake at meals and snacks throughout the day (~20 to 30g/eating occasion) may potentially contribute to benefits for body weight management and appetite control. On a related note, protein-packed foods — like beef — promote satiety which can help cut down on mindless eating. I’ve found that my clients who eat more high-quality protein and fats are better able to cut down on sweets and snacking throughout the day. I especially love grass-fed beef, as it contains a better fat ratio (more conjugated linoleic acids, which function similar to omega-3s). You can find great grass-fed options at most grocery stores and your local farmers market. To find out more about grass-fed and grain-fed beef, check out the Beef Checkoff’s infographic. The Beef Checkoff program also offers a great interactive Butcher Counter where you can learn all about the cuts of beef, including which options are considered lean. Salads don’t have to be made with greens! Top fresh tomatoes with all the toppings for a nice, light dinner. Heirloom tomatoes are super-delicious here, but cherry or regular tomatoes would also work great. Add lean beef to medium skillet and sprinkle with cumin, ground pepper and chili powder. Saute until cooked through. While beef is cooking, wash and core tomatoes, then cut into 8 wedges. Prepare avocado, green onions, lemon and lime zest and cut lime into 4 wedges. 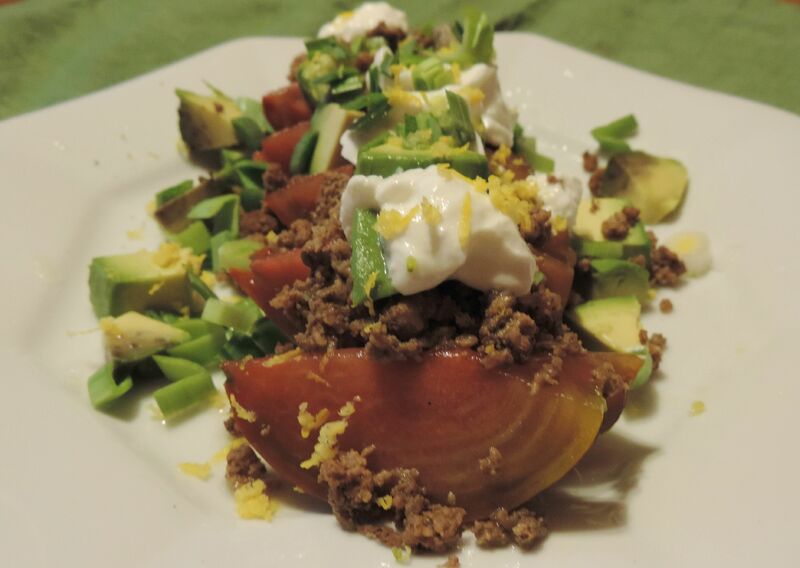 Lay tomatoes onto four separate plates, then sprinkle cooked ground beef over tomatoes, and garnish with avocados, green onions and zest. Sprinkle with sea salt and squeeze a lime over each serving. Add a few dollops of optional plain Greek yogurt if desired. For more awesome lean beef recipes, check out the link below! 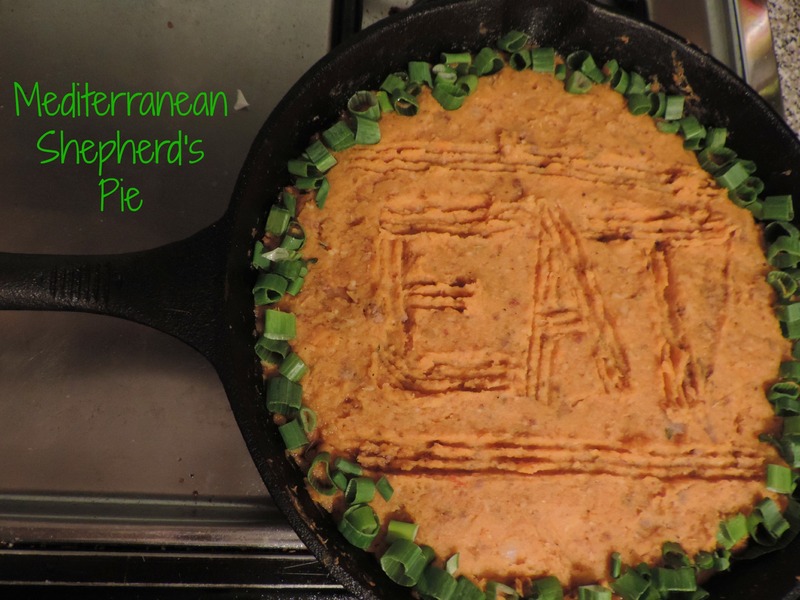 To be honest, I’ve never actually had Shepherd’s Pie until today, but when the ladies of Recipe ReDux tasked us with showing our “Pie Love,” I wanted to go savory. And that’s where Shepherd’s Pie comes in. I have been taking more of a paleo approach to my eating as of late, and eating more healthy fats and less carbohydrates. Most importantly, though, I’ve been trying to cut sugary foods out of my diet. At one point in my life, I was very addicted to sugar, and felt that I had to have dessert after every meal, with my snacks and really any time I could get my hands on sweets. While I still like sweeter foods, I’ve been working to cut junk out of my diet and eat real foods — e.g. fruit instead of cookies and donuts. I found that when I stopped eating a low fat/high carb diet and learned to embrace healthy fats, my sugar cravings naturally improved. 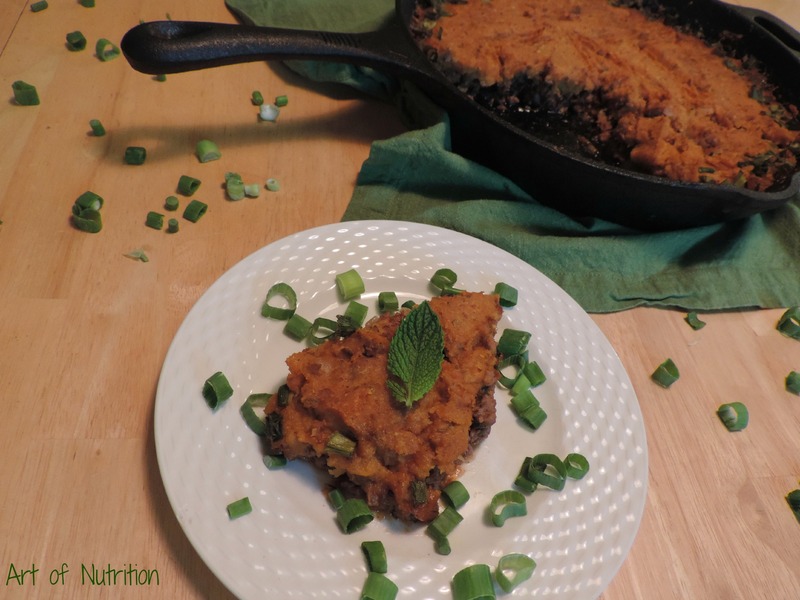 Thus, this is less of a traditional “pie” and more of a meal that you can eat time and time again, switching up the protein, seasoning, or mash (in this case, an amazing sweet potato-parsnip mash that is delicious in its own right). Grass-fed lamb adds a delicious flavor, and is pure perfection when combined with the natural sweetness of raisins and the freshness of mint, then topped with a delicious sweet potato-parsnip mash. Enjoy! Preheat oven to 425 degrees. Wash sweet potato and parsnips well and cut into ~1/2″ cubes. Toss with 1/4 cup olive oil, and roast (I roasted mine in a cast iron skillet) for 35-40 minutes, or until tender. Add roasted sweet potato and parsnips to a food processor, add butter (it should melt from the heat of the roasted vegetables) and process 2-3 minutes. Add beef stock and seasoning (cumin, rosemary, sea salt and black pepper) and process until smooth. Set aside. Turn oven down to 350 degrees. In an oven-safe skillet, such as a cast iron skillet, add 1 Tbsp. olive oil and heat for 1 minute. Add diced onion and saute for 3-5 minutes. Add the lamb and saute until the cooked through. Add in the canned tomatoes and raisins and cook for about 5 minutes, or until the mixture begins to thicken. Turn the heat off, and stir in the mint. Level out the lamb mixture. Spread the sweet potato-parsnip mash in a thin layer over the lamb, making sure the mash reaches the sides of the skillet. If desired, use a fork to make a design or write a message in the mash. Sprinkle the green onions around the outside of the skillet and press them into the mash slightly. Bake for 30 minutes, or until the top starts to brown. This is a great dish to make when you’re having company (a set and forget kind of thing) or as a part of meal prep, for a satisfying dish that will last you the whole week! Serve with green veggies, such as sauteed green beans or spinach, and you have yourself a complete meal! For more PIE LOVE, click the link below!